Right now the standard western protocol for cancer is surgery, chemotherapy and radiation…..yet 1,600 Americans die of cancer every single minute. I feel I need to repeat that. 1,600 Americans die of cancer ever single minute. For years we have been misguided into believing if we just throw more money at curing cancer a solution will be found. A cure that would allow us to pop a pill or get a vaccine and make the whole nightmare go away. A cure that would not ask us to change what we eat, not demand we slow down, not invite us to get involved, not request us to understand how our bodies work or what they truly need. If we want to live long healthy lives, we have to re-think what we have been taught. We have to be willing to ask new questions, open up to looking at the world with new eyes…have the courage to hear the answers and take action. For those of you new to the Diet For Living Tribe, I want to share my own story with cancer. An event that blew my world wide open and led me to be a passionate educator who asks everyone to look at how we view disease and the mighty role we play to determine it’s outcome. 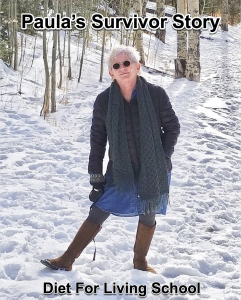 When I was 53, I was diagnosed with uterine cancer. Like most American’s I was conditioned to believe that when you’re diagnosed with this life threatening disease your only option is to bring out the big guns. You know, the Big Three: Go to war with surgery, chemotherapy (a derivative of mustard gas), and radiation. Hand your life over to your doctors, and pray. Yet, when my mom was diagnosed with cancer years before when she was 53, she had done just that….everything western medicine had to offer and died anyway. In the end, she was sent home to wait. Watching her suffer with no options was heartbreaking. Today I know so much more. By a stroke of Divine Grace, a friend suggested I study the works of Dr. Ann Wigmore. She had cured her own cancer using fiber-rich raw plant-based foods, fresh pressed juices, fermented foods and wheatgrass juice. Dr Ann’s relentless faith in detoxing the body of toxins encouraged me to attempt healing myself with diet and lifestyle change. My detour from the normal route to treat cancer lead me on a healing journey I could have never guessed. I must admit, when I began, I was a bit apprehensive. It was all sooo new to me. But as I stayed consistent with the healing foods, my tumor shrank from the size of a melon to the size of an orange in just 3 months. I went from being scared-senseless, to feeling like I was being graced by God. Within a year there was no sign of it. I was cancer free. As my life started to gain some equilibrium I began to study natural nutrition to understand how and why the foods were so effective. The evidence now points to a whole new culprit for the cause of cancer: The American Food System. Pioneering research and scientific evidence is now directing it’s attention to compounds in plant foods to help heal these diseases that have so much to do with us ignoring the Laws of Nature. Dr Neal Barnard, president and founder of the Physician’s Committee For Responsible Medicine, and his Physician’s Committee Research Team, have conducted years of research showing how a new approach to medicine and nutrition can help prevent and reverse serious health problems (Dr Barnard also campaigns against using mice, rats, dogs, sheep and monkeys as research models!!!! Hugs to Dr Barnard!). 90% of modern disease is now considered food and lifestyle related. Change people’s diets to foods closer to Nature…organic, unprocessed, unpackaged, unpasteurized. Cut WAY BACK on the sugar. Detox the body of all the years of toxic buildup and our body’s own inner wisdom allows healing to take place. You can read more about my journey in my book, ‘Diet For Living Cancer-free/what worked for me’. If you feel called to join this movement and long to learn more, please join us for our 100% OnLine training beginning in Spring 2019. Together we can change the world. Signing-up now is a commitment to yourself and your future. > Prepare for 2019 to be your Best Year Yet! Last Day For Our Spring 2019 Early Bird Sale! > $500 off the total price of your tuition!!!! We want to give you all the incentive you need to get healthy, help your family become healthier and bring that knowledge to your community to build a successful career. > Free! 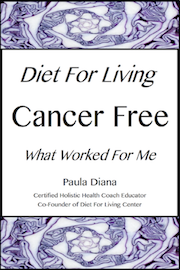 A Copy Of My E-book Diet For Living Cancer Free/what worked for me. > Free! A Copy Of My E-book Creating A Life That Matters. > Free! Thirty Minute One-On-One Business Coaching Call (worth $125.00) to help guarantee your success. > Free! Our 3 Favorite Vegan Cheese Recipes when you subscribe to our Newsletter. Join our tribe of 3000 readers dedicated to learning how to live a better way today. ‘Spring Certified Holistic Health Coach Program’. Please Share Us With Family And Friends!